If you're receiving this error, you may be using an older, non PCI compliant version of our credit card processing interface. Please contact us to ensure you're up to date with the latest PCI compliant software. If you're running in a Remote Desktop Services RDP session, try this first. When swiping a credit card, you will sometimes receive an error, "COUNT NOT READ CARD! Please Swipe Card Again." This error means that the card data is bad, incomplete or the wrong format. If the card looks scratched then you may just have bad or incomplete data. 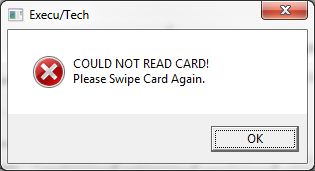 If you just installed a new card reader, and you get this message on all cards, your reader might be in the wrong mode. If you're getting bad or incomplete data, the "PLEASE SWIPE CARD" window might look similar to this image. The X's hide real card data, your window will show the real data. In the image, above, we see 2 problems. First, the second character in the swipe is not valid for financial data. It should be a "B" and not an "E". Second, the data is incomplete. This could be a sign of a bad card swipe or a bad card. Try a Manual Entry. The swiped data must begin with %B and the B must be capital. Sample Track 1: %B6011898748579348^DOE/ JOHN ^37829821000123456789? The card reader should provide what are known as a start sentinal and an end sentinal. This article explains the format of financial card data: http://en.wikipedia.org/wiki/ISO/IEC_7813. Many newer card readers are able to operate in a variety of modes, and sometimes you receive them in an incompatible mode. Usually, there is a utility provided by the manufacturer to change these modes. You can test the mode by opening a program like Notepad and swiping the card. The card data should be seen in Notepad. There should be one line per swipe and you should see the start and end sentinels.